My 5th month blogging. It honestly feels unreal. This is my second month making over $1,000 a month and spending less than 10 hours a week on my blog (not by choice! Work has been busy and I haven’t been able to dedicate more time). TheFab20s isn’t a blogging about blogging blog (say that six times fast), but I love income report and they helped inspire me to start a blog. I’ve read so many and I learned a lot. If you’re interested in starting a blog, learning from other bloggers makes a huge difference and accelerates your growth. All bloggers should make an income report, even if you don’t publish it. It’s a great way to reflect back on the month, see what worked and what didn’t. 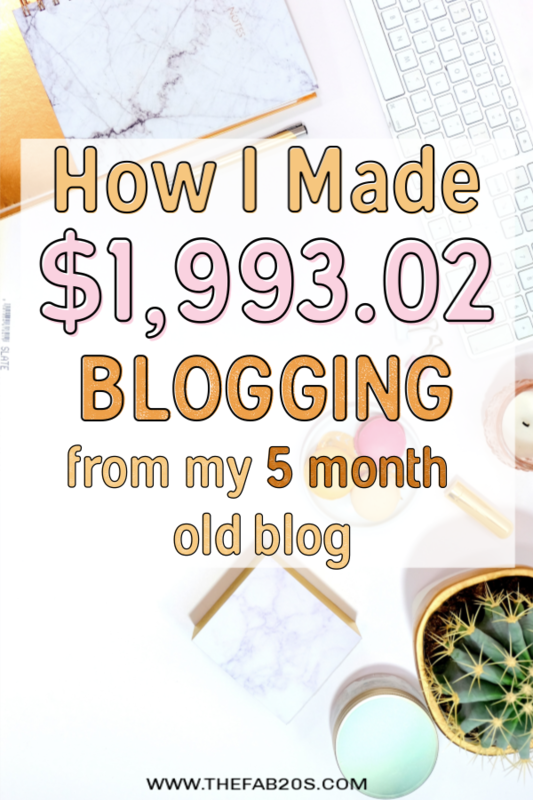 There are some bloggers out there that will say you can’t make money in blogging anymore. Yes, there are a lot of bloggers out there. However, there are a lot of everything nowadays! You ever remember going through the yellow pages and seeing how many lawyers there were? There was easily 60 some pages in my city alone. Or how many painting companies? Ice cream shops? There is competition everywhere, however that shouldn’t scare you. If anything it should motivate you. The fact that there are a million doctors, accountants, and even bloggers is because there is a market for them. That’s basic economy. So, if you are worried about starting a blog just because there’s a 100 more, don’t be! The fact that these bloggers have found success goes to show that you can as well. If you’re willing to put the effort. The problem is so many bloggers give up when they don’t see results immediately. Blogging is a marathon, not a sprint. Take your time. Learn as much as you can. And keep publishing. It is 100% possible to create a blog that produces a sustainable and rewarding income. I want to show others that IT IS POSSIBLE to build a blog and earn extra money on top of their full-time jobs. My income reports are a tool to help you see that earning money through a blog is possible and perhaps motivate you to start your own blog some day! So if you think you can’t create a money-making blog, you are completely wrong! And worse yet, you’re underestimating your capabilities dramatically! If you have been going back and forth about starting a blog, you need to start it NOW. Cut the excuses and the BS you tell yourself about why you can’t and dive in. It’s only scary in the beginning and then it becomes fun! So, now for what you came for….. I got 136,747 page views in the month of March (13% increase from February’s 120,914). Although my page views did go up, I definitely felt a change in my traffic. The Pinterest lull that other bloggers were talking about affected me a bit, but I don’t worry too much about fluctuations. Everything fluctuates and since I’m just starting out I don’t have prior analytics to see what my traffic trends look like year round. If you’re stressing over Pinterest or shifts in your traffic, don’t! There will be high months and low months in everything you do. You just have to be consistent. And as always, I have included a screenshot of my traffic from October as I know some are skeptical of having over 100k page views in 5 months of blogging. You can clearly see there was zero traffic in October 2018. Traffic was always my biggest concern when I started blogging. I knew I wanted to get to 25,000 sessions so I can apply for Mediavine (an ad network that pays so much better than adsense). 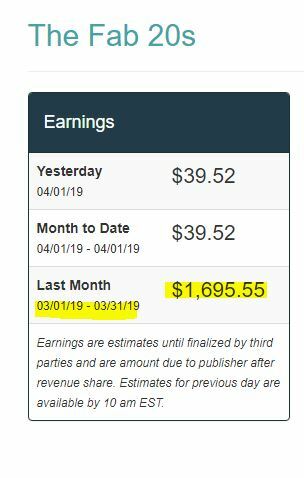 I got into Mediavine in January 2019 and my income skyrocketed in February thanks to them. They do all the heavy lifting in the background and I just publish posts and worry about growing my blog. I make money from the ads on this site on autopilot and it is a great source of (almost) passive income. You just set it and forget it. I have been solely focused on generating traffic from Pinterest using this strategies in this eBook and I accredit a big chunk of my success to Carly’s tips! I can’t believe I was only $6.93 away from earning $2,000 from my blog! I feel so incredibly proud of this amount! Never in my wildest dreams did I think I would be making *almost* $2,000 in my 5th month blogging, and yet here I am. I keep my expenses low but I have been eyeing certain SEO toold to help grow my organic traffic. More on this further below. Also, I prepaid for my hosting as it ends up being cheaper than paying month to month, but even if you decide to pay it monthly, your blogging expenses (when starting) won’t ever exceed $50 a month and have the potential of making you a large sum of money in a short period of time. I have some hefty goals for this blog in the coming months. The first thing I’m working on is growing other sources of income. I have been slowly incorporating the strategies in Michelle’s Making Sense of Affiliate Marketing to grow my affiliate income. Patience is key when it comes to blogging. I had such quick success that I’m getting inpatient with my affiliate income but it is growing! I know bloggers like Michelle make over $50,000 a month in affiliate income but success doesn’t come overnight. I’m almost at $300.00 a month in affiliate income and my Amazon affiliate account is constantly growing! My goal is to hit $1,000 a month in Amazon Affiliates within the next six months *crosses fingers*. I want to publish an eCourse! I have gotten numerous emails about how I grew my blog so quickly and I want to create a little something-something where I spill all my secrets. Everything I have learned and am learning. This is still in the early stages. I have a rough outline but I haven’t yet put pen to paper as there is just SO much I want to put in this eCourse. I don’t want to miss a single detail and make sure I give you guys all the goods. I have a specific blogging email list for those of you that want to learn all my tips and tricks, and when I launch my eCourse! But I want this eCourse to be comprehensive and I want to ensure I know what I’m talking about. I don’t want anyone to think I have achieved these results just because of dumb luck so I have…..
Because I want to write an eCourse and not leave a single detail out, I have decided to create a brand spanking new blog and document everything. I won’t be linking to that blog anywhere on here because I want that to be a completely ‘newbie’ blog and not have any support from TheFab20s. I have created a new Pinterest account for it and it currently has only six articles up but it is LIVE. I launched this baby blog on March 24 and it already has gotten 9,035 page views in less than a week and a half! With only six articles. One of the pins went mini viral and I am incredibly proud of this blog. I will be documenting the entire process and including it in my eCourse so you can copy my success! I want to work on my sites SEO! I don’t want to completely rely on Pinterest for my blog so I have been slowly learning about keywords, backlinks, and all that good stuff. It’s a bit overwhelming and there’s definitely a learning curve but I just remember how I found creating pins overwhelming before and now I can make them in my sleep. Everything seems intimidating when you’re starting out and I’m excited to dive right in. My Organic traffic in January (just two months back) was 469 sessions for the entire month. And in the month of March I finally hit 1,000 organic sessions! Organic traffic is a loooooot slower to grow than the traffic you get from social media sites, but it is much more steady and reliable. You don’t want to put all your eggs in one basket (which is what I have going with Pinterest). I am going back in and optimizing old blog posts with keywords and making them more SEO friendly. You absolutely need to self-host. Self-hosting allows you to have complete control over your website and content. For example, if I didn’t self-host, my site would be ‘www.thefab20s.freeblogsite.com’ instead of my own domain name as it is ‘www.thefab20s.com.’ What successful blogger do you know that has a site like that? But that’s not the only dilemma. Please note, all these limits apply to the wordpress.COM sites as well. You want a wordpress.ORG blog, its the exact same software without the limitations! At this point in time, I only use and recommend Bluehost for domain names and web-hosting. Bluehost gets my stamp of approval because they really care about helping bloggers like you and me to get started as quickly and painlessly as possible. WHAT MAKES BLUEHOST SO GREAT? Bluehost has great performance, they are easy to use and it’s absolutely the best pick for beginners. On top of that, Bluehost offers a FREE Domain, 1-click WordPress Install, and a FREE SSL Certificate. An SSL certificate adds trust with google as well as with your blog visitors as well! If you want to start blogging, head on over to Bluehost and click the green ‘get started’ button. In the beginning, the basic plan is all you need to get started on the right foot. Step 2: Write. A lot. Before you launch, you’re going to want to do the work beforehand. I wrote more than 15 blog posts before my launch. Anyone who visited my site in its early days would have never thought it was only a couple of days old. Create a lot of helpful posts that people will want to read! You’ll notice I don’t have any posts such as ‘my daily makeup routine’ or ‘my favorite pasta dish.’ Why not? Because no one cares! You don’t know me, so you don’t care what I eat, wear, or do. Perhaps after you’ve created a relationship with your readers, they will be interested in your personal life, but in the beginning, you have to constantly be thinking ‘What’s in it for me?” from the readers point of view. Write a lot but with a purpose. Pinterest will be your secret weapon as a blogger. More than 90% of my traffic as a new blogger comes from Pinterest. You will want to make sure you sign up for a Business Account as it will be the best way for you to drive traffic to you brand new blog. You can either use a personal picture or go with a logo. Bloggers have success either way, so if you want to maintain your privacy, don’t feel obliged to post who you are. Once you have your business account you’re going to want to create 20 or more boards related to your topic. By the way, I don’t think you need to pigeonhole yourself! I don’t have a niche and I love it. I write about travel, money, and food. The riches are NOT in the niches. Play around with different topics and see what you like and what your readers like as well. Just make sure it’s a topic you will be creating multiple pins and articles for. There’s no point creating a board if you don’t pin to it often. No matter how great your content is, if you don’t create great pins that get clicked, all your efforts will go to waste. There isn’t a one size fits all for pins. Some pins I think will do awesome tank, and others I’m not too crazy about take off randomly and go viral! The only thing you can do is make sure you create a lot of pins and test them constantly. More than that, if an article isn’t doing so hot, I will make more pins for it two or three weeks later with new keywords! A lot of bloggers use Canva or Picmonkey. I use PicMonkey to make my pins and pay the monthly membership of $7.99 because it allows me to use the fonts I buy on top of a lot of other nifty features. But for the first two months I used the free versions of both Canva and PicMonkey until I decided which one I liked more and bought a plan. You can still make great pins on the free versions! There is so much to learn when you start out. You can’t be scared of investing in a couple of courses. The strategy I used to get my pageviews to over 100,000 is Carlys Pinteresting Strategies and it only costs $47. I am not one to part from my money easily, but Carlys eBook is the best bang for your buck. The guide really makes you understand what Pinterest is about, and her strategy is very useful when you are familiarizing yourself with Pinterest. Whether you decide to invest in Carlys Pinteresting Strategies or not, you will want to constantly be learning and researching. There are a lot of free resources online. I spend a large portion of my free time reading tips and tricks from blogging pros. You can’t assume you know it all. Blogging is always evolving and you have to be evolving with it. What social media’s do they use? How do they get page views? What are the most shared articles they have on their website? How do their pins look like and which pins have most repins? Curiosity and determination will get you far in the blogging world! Yes, Blogging is a business. However, I learned a long time ago that if you don’t enjoy the process you won’t enjoy the results. In the beginning, everything is new and intimidating but I challenge you to change your mindset towards this process. Fear and Excitement are the same emotions. They release the same chemical balances in the body. The only difference is the name and power you give them. Stop being afraid and anxious and feel excitement! Starting a blog can be one of the greatest decisions you make. Learn to love the process of writing, creating pins, and getting to know your readers. I have so much fun creating content for TheFab20s that it doesn’t feel like work. Isn’t that what we all want? Anyways, I am so incredibly thankful to each and everyone of you that stops by my blog! From the bottom of my heart, thank you, thank you, thank you for reading, tweeting, pinning, and sharing this blog. It is because of YOU that TheFab20s is constantly growing! I am so grateful for you all! If you have any questions or comments please feel free to email me at hello@thefab20s.com! I am beyond thankful to big bloggers that took the time to answer my emails and I will always be here to answer yours!